Today's post also returns to other much loved things. Over the last few weeks, we have had some of my Mum's family staying with us (or at least, staying with my parents) here in Perth. The day after our visit to my Canadian family, my aunt and cousin from that branch of the family set out on a trip here. Fortunately the timing allowed us to see them in their home first, and still to see them here in Australia as well. That Canadian aunt is one of my mother's two younger sisters, and the other, who lives in Chester in the U.K., has also made the journey down along with her daughter. Thus, we returned to Australia overlap with two of the three weeks that my two aunts and two cousins are visiting for. There have been many outings and activities over the last three weeks, and as we returned from holiday to work, we have missed out on some of them. However, one of my cousins requested a visit to The Raw Kitchen cafe after seeing me rave about it on Facebook. It probably goes without saying that I was only too happy to oblige, and today we made the trip down as a family. My Dad even attended and made an impressive effort with eating raw vegan food - something that suits my Dad about as much as it may be expected to suit most Dads (i.e., not very well)! He didn't particularly enjoy it, but I am very impressed at him trying and the rest of us enjoyed our food. 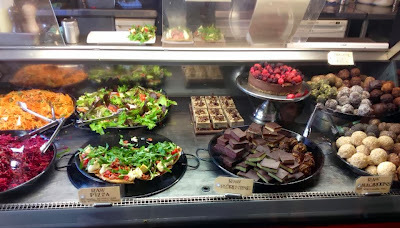 The Raw Kitchen - with raw vegan pizza, falafel, salads, and smoothies. 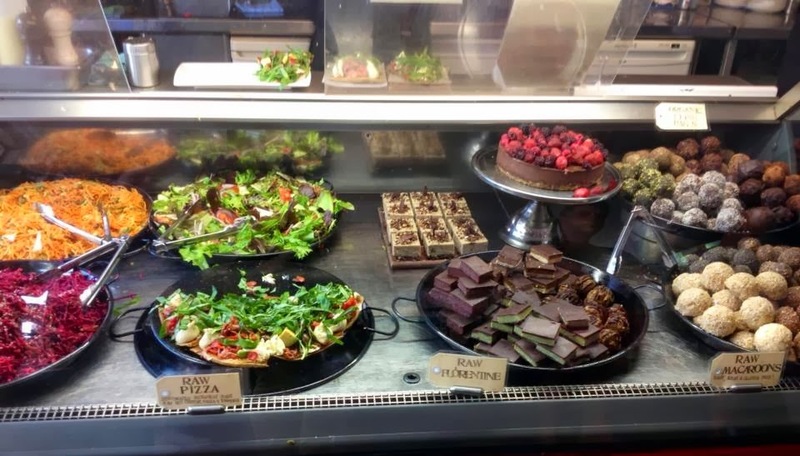 I ordered my standard salad mix (Thai carrot/papaya salad and Tarragon beetroot/apple salad, as reviewed here) and a green smoothie, before finding space for their weekend dessert special: a raw vegan cookies and cream cheesecake. I neglected to photograph the desserts at the table, but brought a quarter of the slice home, along with a fig-based bliss ball, and did at least photograph them. Cookies and cream cheesecake remains, and a bliss ball. It has been wonderful seeing family here in Perth - this being the first time my Mum's sisters have made it to Australia - and it was a good meal within a good weekend. Combine all ingredients in a food processor and process until smooth. Serve with extra fruit. I really need to get more creative using avocados! They're certainly fun to be creative with! I know! I was so impressed! Love everything about this post. I just made choc avo mousse myself for the first time in... since leaving Australia, actually. How lovely that your travel and your Canadian family's travel worked out so perfectly! The Canada/Australia timing was indeed impeccable! And I am delighted you have reintroduced chocolate avocado mousse into your repertoire - that was a long stretch without! Fantastic to come home from a trip with lots to look forward to. Time with distant family is precious. Love that you had a family outing to a raw cafe - I can only imagine how my family would be and it is not a pretty picture - have only ever made chocolate mousse frosting with avocado and it was delicious but my siblings and I had a great dislike of cold wobbly desserts (other than jelly) when I was young that the idea of eating it as dessert is still a hurdle to overcome. Isn't it funny how textures can make or break things? I hope you can summon up the courage to give chocolate mousse pudding a go as I do think you would like it, especially if you liked the frosting variation. And I chuckled at your comment about how your family would be at a raw cafe - my poor Dad really did do very well and I didn't note it in the post, but my brother and Mr Bite skipped coming ;) It was really lovely having the extended family members here. I'm so glad to hear you've been having a ton of fun and had such a great North American vacation experience! This avocado mousse looks so crazy fudgy delicious!! Crazy fudgy delicious is about right! Haha. Great minds think alike! I made avocado pudding over the weekend as well. I used nuts instead of berries, but the blackberries go so well with chocolate. This looks delicious. Also, I'm glad to hear that you had a good time with your family! So glad you had a wonderful time with family :) And that dessert- YUM! Aw, bless your Dad for that though! My Dad isn't big on desserts generally otherwise I think that would have been an easier way to win him over! How lovely to have a visit from family from abroad. This dessert looks wonderful - perhaps dessert is the best use for the buttery, rich avocado. Oh, wonderful. Close to home is so good! It's great that you were able to manage a family outing here but I can't believe you are still ordering the same salads! Your dad deserves a medal for braving the raw food. You have reminded me that I still need to branch out and try avocado in desserts as I love it in all other ways! I know, I am terrible at branching out! Every time I go for lunch (and there have only been a handful of times), I tell myself that I really must try something new. And every time, I end up thinking "it might not be as good!" and getting what I know I love. They're moving premises soon though and will be open for dinner, so *then* I think I'll manage it!